The graphic below shows the talents that the Tutor/Mentor Institute, LLC seeks to combine in a team of people and organizations working to help more and better volunteer-based tutor/mentor programs reach kids living in high poverty areas of the world. That's our mission. This is the team we need to build to achieve it. One section of this graphic focuses on "knowledge management" and includes visualization and social network analysis. 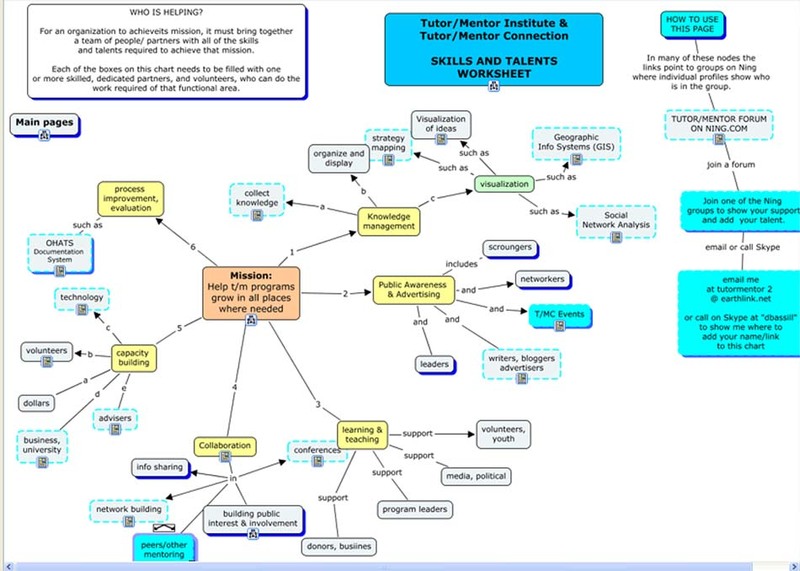 Such talents are needed to turn this graphic from a static image, to a concept map such as this, to an interactive platform where people can log in, choose what group they want to be part of, then show up on an updated version of the concept map. Another role of knowledge management and visualization would be to create debategraphs, like this one, to help organize the ideas we're talking about and show how they connect to each other in an on-going process aimed at building and sustaining our work for many years. In this case, the goal is not just to sustain Tutor/Mentor Institute, but to help sustain hundreds, if not thousands, of individual tutor/mentor programs operating in multiple cities. If we can create these tools and apply them to our own team building, we can share them to help with team-building in any tutor/mentor program, any intermediary network, and any social benefit cause. If we can earn income from leasing these or training people to use them we can sustain our efforts without dependence on government or philanthropic support.